Find all the most useful DIY tips in our furniture paint cost guide. We also included the costs involved when hiring a Pro to do the job. Let us just imagine that you have inherited an old chest of drawers from your grandmother. It’s not a valuable antique as far as you can tell, but just a well-used and hardworking piece of bedroom furniture. You don’t want to throw it away or even pass it on to someone else as there are many more years left in it. But……it just doesn’t blend in with your other furniture. It is a typical 1940s utility style chest. It isn’t pretty but very hard wearing. What do you do with it? 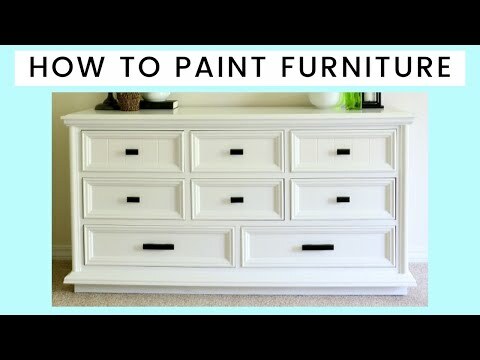 Have you ever tried painting furniture? It is a good, honest, low cost way of brightening up and revitalising old and tired furniture. If you choose the correct colour paint then it will match and complement your existing furniture as well. Today we are going to discuss painting furniture and see what the cost is like. Why would we want to paint our furniture? Good quality furniture lasts for many years, but on the way it collects wear and tear with a few dents, scratches and chips thrown in for good measure. The chances are that the piece of furniture was originally finished in some kind of stain and polish, lacquer or varnish. To have the piece professionally repaired and refinished in the same style would more than likely cost more than the furniture is worth. To try to do the job as a DIY project is probably going to be far too difficult for the average amateur, after all hardwood veneer repairs and French Polishing is not part of the usual DIY skillset. The next best thing is to repair with ordinary softwood or with wood filler and cover everything up with paint. Before we start talking about the paint, let’s just have a little side-track and see what other options are available, after all, your piece of furniture might be a fine example of a Chippendale oak chair, and you wouldn’t want to paint that! If in doubt, take it to a reputable professional antique restorer. The professional will be able to give you an idea of the cost to repair and refinish it to its original condition. There will be a few factors which will affect the cost and you should consider these carefully before making the decision. Refinishing. If the furniture is in a very bad state then it is likely that it will need to be refinished. This involves stripping all the original finish, sanding down the wood and then giving it a new coat of finish. If it is a real antique then you must have the finishing done to a high standard otherwise the piece will lose much of its value. Refurbishing. This is a much gentler approach and involves cleaning the existing finish to remove any build-up of old wax or dirt followed by a light sanding and a touch-up of stain. This will obviously be a lot cheaper than a full refinish but it is only really applicable if the damage is slight and a lot of repairs are not necessary. Damage. Before the new finish is applied, all repairs and replacements must be completed. The cost will be higher if there is more damage. Size of piece. Larger pieces of furniture will require more time and more materials to repair and finish. This will result in a higher cost. Type of finish. Once all repairs have been completed and the wood has been sanded, then the required finish must be applied. There are simple finishes such as varnish and paint or there are finishes such as French Polish and lacquer which require significant expertise to apply properly. Obviously the application of varnish and paint finishes will be less expensive than the application of the others. Antique or not? If the furniture is antique then more care will be taken to restore the piece to its original condition. This often requires special knowledge and expertise for restoring antiques. The repairs and finishing must be done sympathetically so its value will not be reduced drastically. Costs to restore antiques tend to be higher than other types of furniture. There are many different types of paint and each one will give your furniture a different ‘look’. No matter which style you want to end up with, you will have to prepare the furniture so that the paint adheres properly. Let us run through a few steps to show you what preparation is needed. Bear in mind that a professional will also use these steps so this should give you an idea of how much work is involved. Remove the metal. Nothing looks worse than paint being in a place where it is not intended to be. You will not want the layers of paint to encroach on the metal fittings. Carefully unscrew all handles and knobs and store them safely until needed. If there are hinges on the doors then remove the doors from the furniture and take off the metal hinges. Store these as well. Clean the metal. Take each metal fixture and carefully remove all traces of paint or varnish (or any other finish coat) that might have built up over its lifetime. Check all the screws are in good condition and replace if needed. Use a metal cleaner and polish to remove all traces of foreign matter. After they have been cleaned, store them safely away until needed. Prepare. If you don’t prepare your surface, the new paint will crack and peel and before you know it the new paint will have fallen off exposing the old surface underneath. First thing to do is to give the surface a really thorough cleaning. Use household detergent mixed with water and an old cloth rag. Make sure you wring out the rag to remove all excess water before wiping the furniture. If you prefer, there is a proprietary product called Oil Soap which is ideal for removing all traces of dirt and grease from the wooden surface when used in accordance with the manufacturer’s instructions. Don’t forget to wash each component separately and allow to dry thoroughly. Sand. Using medium grit sandpaper remove all the glossy finish of the previous paint. If you are merely painting then you don’t need to remove the entire original surface as long as the gloss finish has gone. Repair. If you need to do any major repairs on the furniture, you must get those done before you go any further. Finish off repairs by rubbing the surface with the sand paper once again. Primer coat. Make sure the wood is completely dry and free from dust. Apply some oil based wood primer onto the bare wood. This helps the subsequent paint adhere to the surface as well as covering over any difficult stains and discolouration to make the surface a continuous uniform colour. Sand once again. This time use fine grit sandpaper as you are attempting to get rid of any glossy surface and paint run from the previous coat. In fact use this grade sandpaper between every coat of paint. Lightly sanding each coat in this way will ensure you have a smooth even surface and give a more professional appearance. After each sanding session, remove the sanding dust before proceeding to the next stage. If you can get hold of a tack cloth for this you will have much better results as all the sanding dust will be collected by the cloth. Paint undercoat. Undercoat is used to give the top coat a sound and smooth base. You can use a brush to apply the paint or even a small foam roller. Whichever one you use, make sure you apply a thin even coat. Don’t forget to sand between coats and remove the dust afterwards. You can give as many coats of undercoat as you wish but ensure they are all thin coats. Paint top coat. The thing to remember with top coat is to make it as glossy as possible. The glossier it is, the easier it will be to keep clean during day to day use. Personally I would use an indoor latex or vinyl paint in a semi-gloss finish. Although gloss is easy to clean, it doesn’t look as good as a semi-gloss. So a vinyl silk or satin finish would be ideal, giving you a washable semi-gloss finish. You can apply the paint by brush but keep all the brushstrokes in the same direction and make sure brush bristles don’t stick to the paint. You can also apply the paint with a foam roller as well, especially if you have a large area to cover. The best way to use a roller on the top coat is to apply the paint with the roller and then run the brush across the wet paint in the same direction to avoid brush marks. In my experience the easiest to use and control are the brush and foam roller. Water based paints are very easy to clean out of the application tools, but if you are using oil-based paints then I would use a foam roller and dispose of it afterwards. They are so inexpensive that it really isn’t worth the hard work and time washing out the roller with solvent. Seal and protect. Wait for the final coat of top-coat to dry for at least 24 hours. Now you can seal it. If you are using a coloured paint then you can use clear polyurethane varnish to give the final protection (Polyurethane will tend to turn yellow with age so don’t use it on very light colours or white). This also comes in satin finish so you don’t need to have the finish too glossy. nother sealing option which can be used on any colour top-coat is to use furniture finishing wax. Just apply the wax with a lint free cloth or wax brush and let dry for 15 minutes. Then buff the surface with a clean cloth until shiny. Do not touch the surface for two days to allow the wax to harden. What is chalk paint and how to use it? Did the previous method of painting your furniture seem too much like hard work? Do you want an effect that is far less formal? 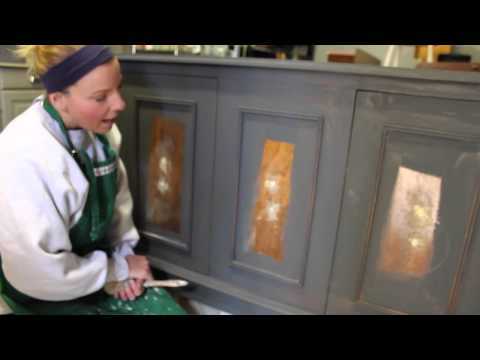 Then try chalk paint furniture and see what different effects you can make. Everyone is talking about chalk paint. What exactly is it and what is it used for? The term ‘Chalk Paint’ is actually a brand name trademarked by Annie Sloan. Other companies make something similar, with similar effects, but it cannot be called chalk paint. They can all be used on furniture to produce a chalky appearance. Chalk paint is a type of paint that you can apply onto any piece of wood with little or no preparation. It doesn’t matter what type of existing finish you have, you just remove the hardware such as handles and hinges that you don’t want painted and start painting. You don’t need to be a perfect painter, in fact it helps if the appearance is rough and ready (just don’t create any runs in the paint). It doesn’t need the paint applied in straight lines like other paints; in fact it just gives a different appearance if the paint is applied with criss-cross strokes. Almost anything can be covered using two coats which is just as well because the price of the original Chalk Paint is extremely expensive (there are cheaper alternatives so it is now less expensive to chalk paint your Welsh Dresser as it used to be). The painted surface can then be distressed or left as it is. Some people think that the ‘distressed look’ means that it should look like it has been dragged behind a car doing 70mph. This is not so. Distressed paint merely looks like it has had many years wear and tear and has been loved. Actually chalk paint can be used on almost every other surface as well as wood; but we won’t go into that as today it is purely about furniture. Let’s run through the steps needed to use chalk paint. You will find that most of the first steps are common sense and will apply to any DIY project. Choose your furniture. As a first try, let’s choose something small. How about a hand-me-down coffee table that has lots of cup ring stains all over it. It has a drawer with a metal handle. Paint brushes. Annie Sloan sell brushes specifically made for their paint, but any normal paint brush will be adequate. Choose some like 2” square edge brush and a 1” angular trim brush. Annie Sloan Clear Soft Wax. One 500mL tin is adequate. Annie Sloan Wax Brush. For applying the wax. Rags. You will need two clean soft lint free rags. Typical choices are microfiber, cheesecloth or cotton t-shirt (without seams). Hardware. Choose a new handle for the drawer. You will want one that compliments the paint colour and style of the table. Other supplies. Other items you may already have in your tool box so have a look before going out and buying new ones: Brown builder’s paper, painter’s blue masking tape, paint can opener (a wide flat bladed screwdriver is good for this), wooden paint stirrer (garden bamboo or anything similar), screwdriver (correct size to suit hardware screws), protective rubber gloves, paper picnic plate, plastic picnic knife. Ambient temperature. Chalk paint experts recommend working at room temperature. This means, not too hot and not too cold. You could work outside but it is better not to as you can control the temperature better when inside, there are less flying insect that might land on the wet paint, less chance of dust landing on the paint. Good ventilation. Whenever you are working with any paint, wax or polish try to work in a well ventilated area. If the room is particularly small, then open a window or use an electric fan to keep the air moving while the paint is drying. The makers of Annie Sloan say that their paint is non-toxic and low odour so you won’t have to worry about strong fumes or volatile organic compounds (VOCs). Good lighting. Obviously working in natural daylight is best but often if the weather is overcast or you are working into the evening you will need additional lighting. Make sure you have access to table lamps or spotlights. Protect the floor. I have specified using builder’s paper and painter’s tape to spread on the floor, but realistically you can use anything such as a drop sheet or a sheet of polythene. If you find it difficult to work at low levels then it may be worth raising the work piece onto a table or workbench. Whatever you use, the aim is to protect good furniture or the floor from paint drips. Prepare and clean. Put your workpiece so you have easy access and can work at a convenient height. Either put it on the floor or on a raised bench. Remove loose items. Separate any removable components such as drawers, doors, shelves, hinges and handles. Check for rough patches. Run your hand over the entire surface and see if there are any rough areas which will need sanding smooth. Remember you will only need to sand these areas, not the whole surface as Chalk Paint does not need surface preparation. Fill holes. Check any holes or cracks and fill with wood filler or PVA wood glue. Clean. Use dishwashing detergent liquid (for handwashing not the dishwasher type) and water to remove any trace of dirt and grease. Even if it looks clean it will still have traces of grease from handling. After washing use clean water to rinse off any detergent residue. Allow to dry. Let the workpiece dry completely before applying the first coat of paint. Mask non-painted areas. There will be areas that do not require painting such as inside the drawers, Use the masking tape to edge any areas that need protecting. This will ensure a sharp edge to the paint. Paint application. At last we get to the Chalk Paint (I bet you thought we would never get here didn’t you?). Open the paint tin and stir it well using the wooden paint stirrer (A good tip I always use is to turn the tin upside down before opening the lid to let the solids distribute themselves. Let it stand for an hour or so. Or you can shake the tin before opening.) Whatever you do, the idea is to thoroughly mix the paint ensuring all the solids are evenly distributed throughout the liquid. I expect you are feeling a bit nervous now as this may be the first time you have used Chalk Paint. Choose a place on the workpiece that isn’t in obvious view and start there (maybe the back of the legs?). This will give you an opportunity to learn how to apply the paint on a ‘less important’ area. A few tips when using Chalk Paint. ✓ Chalk paint is very thick so it is very easy to apply too much from the brush. Don’t worry, there is enough time to go back over a thick section and brush the paint out. ✓ Work straight from the can rather than transferring the paint to a paint kettle. Between brush dips replace the lid otherwise the paint will very quickly thicken in the tin and become more difficult to manage. ✓ Apply the paint using the brush against or with the grain, whichever is easier. Finish off with smoothing the paint along the grain with your final strokes. ✓ If you have to take a break from painting for whatever reason, wrap the brush in Clingfilm or a Ziploc and put it in the fridge. This will prevent the ✓ paint from drying out on the brush. When you have finished doing the first coat and notice that the paint looks all streaky with brushstrokes, don’t panic! This is perfectly normal and will look much better after the second coat. Apply the second coat of paint. The first coat won’t take long to dry, probably less than an hour. When it has dried start on the next coat. Apply it in the same manner as you did for the first coat and smooth off the brushstrokes in line with the grain. As it dries you will see all the brushstrokes disappear and you will be left with a smooth finish. For most applications two coats should be enough, but if the wood grain is still peeking though, you can add a third coat. Four coats would be too much and will ruin the smooth finish. Clean the brushes. People never like to clean their paint brushes but it is so easy that it is worth it to keep your brushes lasting for years. All you do is rinse them through with warm soapy water to remove all trace of paint. Take a piece of medium grade sandpaper or a sanding block and lightly sand certain areas of the workpiece. Use a light hand and only concentrate on those areas that would become worn naturally through age such as, edges, tops, corners, wooden knobs, trim and detailing. Dust off all the sanded areas with a dry brush or damp cloth. Use the plastic picnic knife to cut a piece of wax and place it onto the paper plate. Take your wax brush and dab it a few times into the wax until you get some wax on the tip of the brush. Using a combination of circular and side sweeping movements, massage the wax into a small area of the workpiece. Always finish each area with a sweep in the direction of the grain. As you work across the area the paint will appear to slightly darken. It isn’t really becoming darker it is just the colour becoming enhanced. Try not to get any bristles trapped in the wax but don’t worry too much if they do because we will get rid of them in the next step. Put down the brush and use the lint-free cloth to wipe the wax into the wood in the direction of the grain. This will also remove any excess wax at the same time. Just use a couple of uniform sweeps across the area to do the job. Repeat the method on the next small area and work your way slowly across the whole of the workpiece. You may find that the cloth becomes waxy after a while and you need to replace it with a clean one. More wax? Most areas of the workpiece will just need one coat of wax, but if you have a table top or a similar area that will take a lot of wear, it is probably better to add another two coats making three in total. Leave about 24 hours between each coat, allowing the wax to harden. After the final coat you will be able to use the furniture after about 24 hours, but use it gently as the wax won’t completely harden for about 30 days. Clean the wax brush. You don’t want the wax to harden on your wax brush so make sure you clean it thoroughly. Use half a cup of mineral spirits (in the UK this would be white spirit or turpentine substitute) and leave the brush to soak in it for a few hours. After that rinse the brush in warm soapy water and leave to dry. Buff the furniture. Twenty-four hours after the final wax coat, you can give it a final buff. Use a soft lint-free cloth and rub across the workpiece in circles to bring up a glossier finish. Refit the hardware. If you are going to the trouble of making the piece of furniture so good looking, why don’t you choose some new hardware to replace the old ones? In our coffee table we only have a drawer so a beautiful ceramic knob would finish everything off perfectly. So far we have concentrated on painting furniture as a DIY project, and in fact that is what the majority of furniture painting projects are. People do it as a hobby and use the medium to express their artistic side. There are contractors available who will happily paint your furniture for you, either specialist painting professionals or handymen. As we discussed earlier, repainting is one of the cheapest ways to refresh and update an old piece of furniture. If you are doing it yourself then all you need to pay for is the paint and accessories. If you want to hire a contractor however then the prices will vary depending on the size of the furniture and how much work is needed to make it into a paintable condition. In the table below we can see some average costs for typical pieces of furniture. While the cost to sand down furniture before painting is usually included in the price, any repair work will have to be charged extra and in fact may need to be done by a furniture restorer or joinery specialist. It would be highly unlikely that a normal painting contractor would do anything more specialised than filling holes and sanding. Professionals will usually charge by the hour for a job that they are not sure of the duration. A painter’s hourly rate, on average can be anything from $20 to $40 per hour for work such as this. Likewise a handyman’s rate would be comparable. Skill. The painter’s experience will be the main factor. There are many aspects to painting with more specialised tasks costing more. The more different painting skills a contractor has, the higher you can expect his hourly rate to be. Location. The average wage for the area where you live will have an effect on the cost. Size of job. How many pieces of furniture will need to be painted? Where? If a contractor is able to take your furniture away with him and paint it in his own time, you may have the work done slightly cheaper. He will be using his own workshop and be able to fit the job in between other larger jobs. The costs of materials for DIY painting will vary depending on what kind and what brand of paint you purchase. The following table shows typical prices of accessories needed when you are using traditional oil based paint to brighten up your furniture. Annie Sloan Chalk Paint® requires slightly different accessories to traditional paint but you can probably make do with items you already have in your tool box. All it needs is a bit of thinking outside the box. There are also many cheaper brands that produce almost the same product. On the other hand if you are happy with paying premium prices for the original Chalk Paint then go ahead. Costs to buy supplies for chalk painting Chalk Paint? There are some tips to make sure your painting job goes smoothly. Make sure you have all your supplies to hand before you start. Have a work space away from the ordinary day-to-day activities in your home. You may have to leave the work half-finished in order to do something else and you do not want to have to clear up and move a half painted chest out of the kitchen before making dinner. Make sure you have enough paint to complete the job. Preparation is everything. Make sure all surface holes and indentations are filled and the surface is sanded smooth. Remove all dust before applying paint. Do not touch the paint surface until it has completely hardened. Make sure surfaces are protected against paint spills, splashes and runs. There are many factors in favour of choosing to do your painting yourself as well as factors in favour of choosing a contractor. Most people are able to do painting so this really isn’t the issue. What is important is the fact that a contractor will be able to complete the job in far less time than the amateur and has the skill and expertise to paint with clean lines and no brush marks. However what is far more important is the fact that a professional contractor will be insured and licensed. If things go wrong, such as when the paint tin gets kicked over and ruins your new carpet, the contractor will have enough insurance to cover the cost of a new one. Their insurance company will probably not quibble whereas your home insurance company may decide that a professional should have been doing the job and not pay out compensation. Old furniture, especially furniture that has original paintwork over 30 years old should be tested for the presence of lead and other heavy metals. You will have to hire a specialist lead testing contractor to do this job and then decide if the value of the piece warrants the added cost of removing all the original paint before applying modern paint. The following are just some of the points needing consideration when looking for a dependable painting contractor. Quotes. Ask for estimates or quotations from more than one contractor. This will give you a better idea about the problems involved with the work, and how much it will cost. License. Ask around for a licensed painter who has worked on furniture painting before. If you want Chalk Paint on the furniture then it is essential you find someone with that relatively new skill. Location. Find out if the contractor would rather do the job at your house or whether he wants to take it to his workshop. Breakdown. Ask for the quotation to break down the cost into materials and labour. Make sure the quotes itemise the materials as well as the specifications of each coat. Insurance. As stated earlier, a contractor must have insurance cover. Deposit. It is acceptable for the contractor to ask for an up-front deposit, but do not pay more than 10% of the total cost. Do not pay the final balance until you are happy with all the work done. Extras. Make sure all hole filling and sanding is included in the price. ✓ Wear disposable gloves when painting to protect your hands from paint and solvents. ✓ Use a dust mask when sanding. Wood and paint dust can cause serious long term lung conditions. ✓ Wear safety spectacles to prevent dust from entering your eyes. ✓ Do not eat, drink or smoke while using paint or solvents. ✓ Keep the working area well ventilated. ✓ Dispose of empty paint and solvent containers in accordance with your local and national waste disposal regulations. ✓ If using power tools or compressors make sure you have had training in their use. ✓ Read and follow the manufacturer’s instructions when using paints and solvents. This may be printed on the outside of the original container or you may be given a Safety Data Sheet (SDS) which will list all the properties of the substance together with the health, safety and environmental hazards and their mitigation. ✓ Take suitable precautions when handling or storing solvents. ✓ Always wash your hands after using paints and solvents and before eating. ✓ Keep children and pets away from paints and solvents. ✓ Never expose solvents to a naked flame. ✓ Be aware that paintwork on old furniture may contain lead and other heavy metals. In this article we have talked about and discussed the application of paint onto your old furniture. We talked about painting old furniture as well as the other options available on more expensive pieces. We then learned about how to paint furniture using traditional oil based paints as well as modern chalk paint. We talked about using professional painters and their advantages as opposed to doing the work as a DIY project. We discussed the various costs and factors affecting costs when using a contractor and looked at some tips for making the job go smoother. We then talked about what safety rules must be considered when painting furniture. We hope you have found this information useful and look forward to the next time.